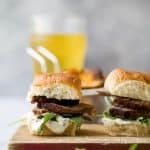 Beer Braised Slow Cooker Brisket Sliders tender moist brisket served on Hawaiian rolls then slathered with a creamy horseradish aioli. This easy flavorful appetizer is sure to be devoured as soon as it hits the table! To a medium bowl add mayo, prepared horseradish, whole grain mustard, lemon juice and garlic powder. Stir to mix everything together and set aside. To a small bowl add garlic powder, smoked paprika, salt, black pepper, onion powder, ancho chili powder and thyme. Mix everything together. Rub spice blend into both sides of the brisket. Place seasoned brisket in a large (2-3 gallon) ziplock bag. (or you could place on a baking sheet on cover with tin foil) Let the brisket sit overnight. Next add sliced onion on top and cover with your choice of beer. Line a baking sheet with tin foil. Remove brisket from the slow cooker and place on prepared baking sheet. To each Hawaiian roll add 1 teaspoon of horseradish aioli, a small handful of arugula and 2 slices of brisket. Repeat process until all the sliders are prepared.